I love methi (fenugreek) and enjoy aloo methi sabzi during winters, especially mom-made. After marriage, I hardly get a chance to relish the sabzi made by her. 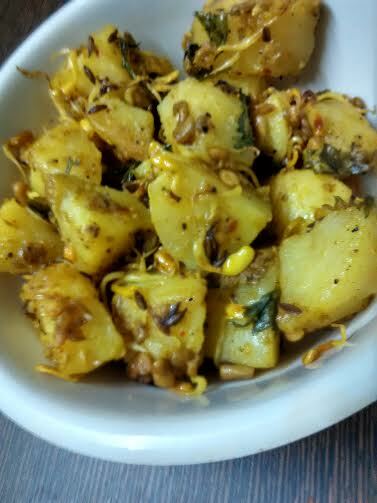 We miss aloo methi during summers. Of course, we do not find methi leaves during the hot season. Recently, I found Radha Natarajan - a friend and fellow blogger - share methi sprouts. 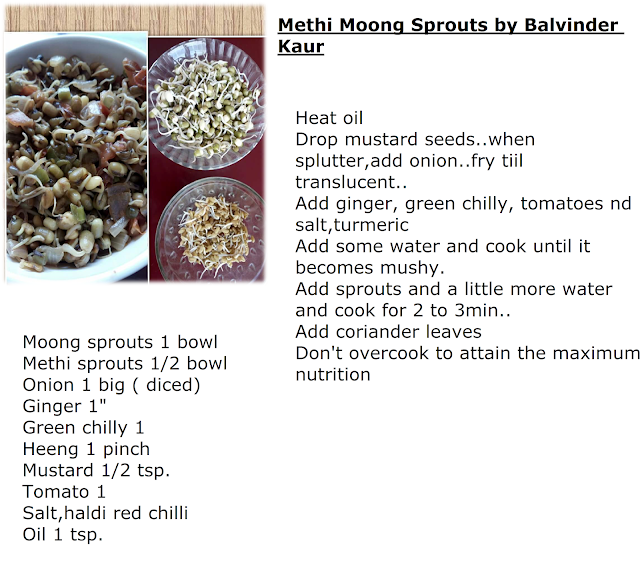 Click here to see how to make methi sprouts. Immediately, I made sprouts and was wondering what to do with it. 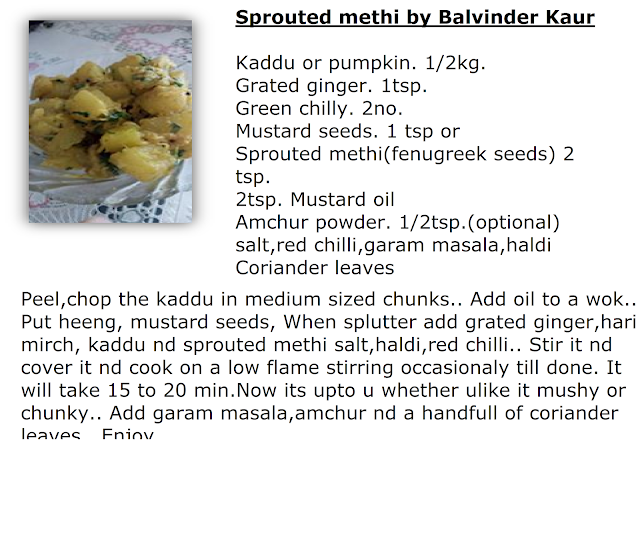 Today, I saw another post from Radha Natarajan, where she had used methi sprouts with potatoes. She shared the recipe with me and I made just a few adjustments and instantly went ahead with the recipe. Now that I have tried the super easy recipe and was amazed to see the results. It tastes just like methi aloo sabzi. Oh I am loving it. My summer cravings for methi aloo have an answer now. Wow! 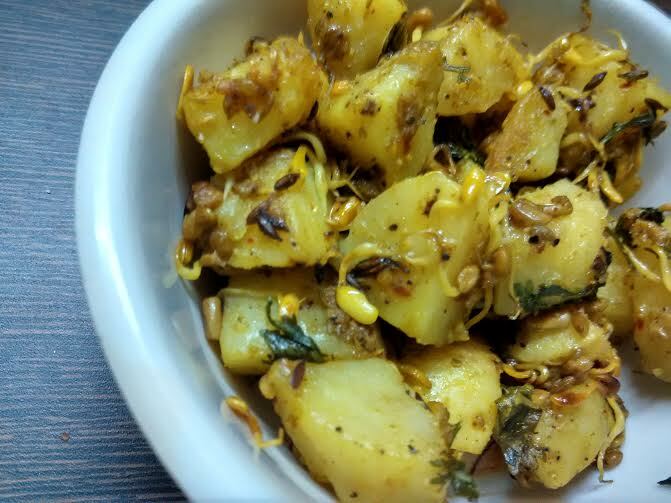 Cut boiled potatoes into cubes and marinate with salt, haldi, coriander powder, and sambar powder. Keep it aside. If you are taking unboiled potatoes, then you do not need to marinate them. Rest of the procedure is the same. Take oil in a pan. Now add marinated potatoes and methi sprouts. Cook & cover for 5 minutes on a low flame. Take off the lid and add salt and the required amount of masala powders. Garnish with coriander leaves and again cook & cover for another 3-4 minutes. Enjoy the aloo-methi sprouts stir fry with roti or rice.